It was a crusade that began three years ago. George Koumantzelis and a small group of “Pow-Wow Oak Protectors” made it their mission to save a 320-year-old oak tree on Clark Road in the city’s Belvidere neighborhood. This is no ordinary tree. It is said to have been the spot where, cloaked in its protective shade, the Wamesit Indians made decisions, engaged in diplomacy, war, trade and discussions of their spiritual direction. his group were successful in proving the tree sits on city-owned land. 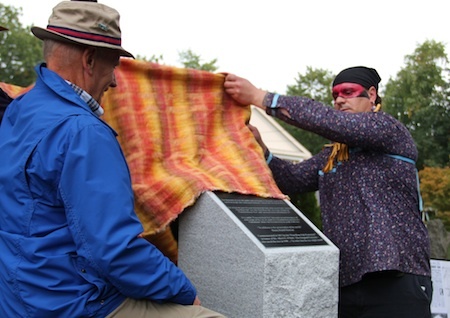 Pow-Wow Protectors unveil granite marker commemorating historic oak. placing restrictions on its use. public — and at times ugly — battle with the Tewksbury Historical Society, which originally served as the group’s fiscal agent. That relationship was severed by a judge and the Protectors soldiered on. Their efforts were ultimately rewarded during a September ceremony at the old oak, where a granite marker was unveiled to celebrate the tree and educate passersby on its historical significance. City Councilor Rita Mercier as well as Brian Martin and Amy Greenwood from U.S. Rep. Niki Tsongas’ office turned out for the ceremony. Onkwe Tase, an Iroquois Elder of the Mohawk Turtle Clan. Oak Protectors; and Steve Hattan and Bill Mrozowski from the Belvidere Neighborhood Group. who had assisted in protecting the tree. “It was a group effort and a community service saving this tree,” he told city officials. Koumantzelis left officials with a passage from historian/writer T.H. Watkins’ Redrock Chronicles: Saving Wild Utah. Jennifer Myers has a bachelor’s degree in journalism from Boston University. A former reporter at The Sun for more than a decade, she now works as an aide to Mayor Patrick Murphy. A history buff, Jennifer can often be found combing through old newspaper clippings and documents at the Pollard Library or rummaging through the attic of City Hall to uncover pieces of Lowell’s past. You can read more of Jennifer’s Mill City musings on her popular blog Room 50.